Recently Charles Nix kindly sent me an image of lettering that he had received as a gift. He was told that it was by W.A. Dwiggins for The Colophon vol. I, no. 1. In trying to confirm that it was indeed the work of Dwiggins I discovered that it was actually the lettering for title page of The New Colophon vol. II, part 8 (February 1950) rather than for the earlier incarnation of the periodical. The rest of the title page was set in ATF Bulmer and Linotype Caledonia. Original lettering by W.A. Dwiggins for The New Colophon title page. From the private collection of Charles Nix. 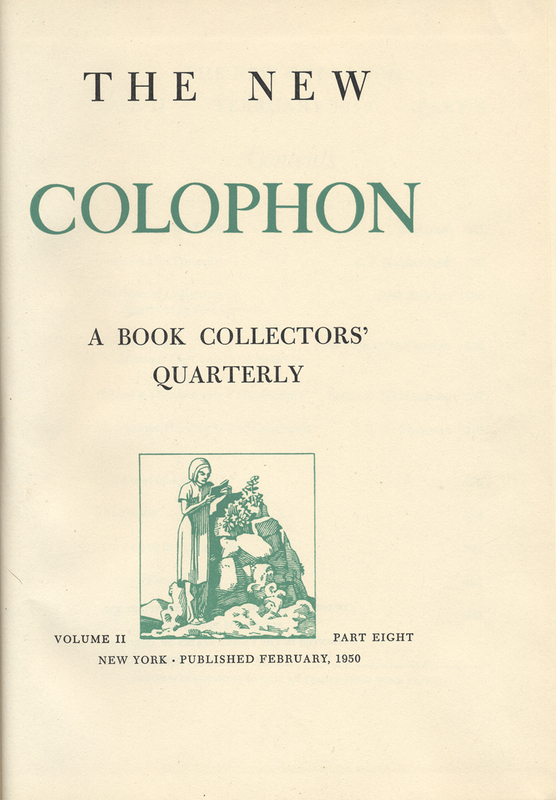 Title page of The New Colophon vol. II, part 8 (February 1950). Design, lettering, and illustration by W.A. Dwiggins.